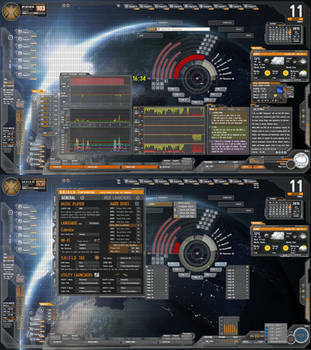 Fully customizable desktop skin suite to view the most important informations of your system and to launch programs. 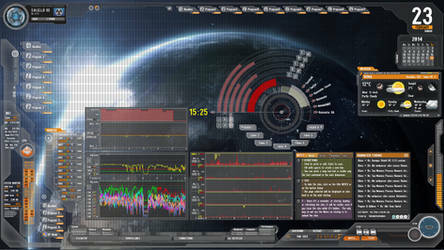 To use it, you must install Rainmeter, a program with endless solutions and possibilities, the only limit is your imagination. Updates and new features in development, despite the short time available. Thanks for and , comments and suggestions. Help Support Japan. The country was hit by an 8.9 Magnitude Earthquake earlier today. fella is working to help through art and funds! Here is what to do! 4. Then show us by commenting in the journal. The Journal Can Be Found here: https://fella.deviantart.com/blog/39039300/ or by clicking the title above. Current Residence: Here, there, everywhere but far from home. Hi i have a question I am working on a mod / update of this skin and i wanted know is it posibble to change the direction of the text? I changed the look of the skin by making the panles appear to go into the screen and not flat. but now the text floats ontop of them how do I make it look like Star War scrolling text? Do you have any updates planned? Yes, mostly finished version 2.2.0, almost updated, code cleaned and I also added new functions. Some small problems still to solve (this is the problem), so, other functionality were moved on the next release*. I have no free time at the moment, I still have problems with my family and my job, so I still have to delay the release. I know, a very long time is passed from my last update, I uploaded only some small patches for some skins. I'll do all my best to make it available and to try to be forgiven. Great work takes time. I rather you release something you proud of than something you will regret.